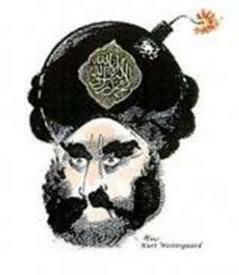 Islamists in Solingen, Germany attacked police today after far-right protesters showed controversial cartoons of the Prophet Muhammad drawn by Danish cartoonist Kurt Westergaard. Radical Islamists attacked police in the western German city of Solingen on Tuesday in protest of a far-right demonstration where anti-Islamic cartoons had been put on display. Some 30 Salafists were arrested after injuring three police officers and a passerby by throwing stones and wielding poles from protest banners, police said. Pro NRW, categorized as an extremist right-wing group by Germany’s domestic intelligence agency, had staged a demonstration near a Salafist mosque in Solingen. “Several Salafists wearing turbans suddenly jumped over the cordon and threw stones at police officers and also hit them with flagpoles,” police spokeswoman Anja Meis said. Pro NRW has said it will run a “Muhammad cartoon contest” and put the cartoons on display outside 25 mosques in the western state of North Rhine-Westphalia. The move, a campaign stunt aimed at generating publicity ahead of an election in the state on May 13, has been widely criticized.